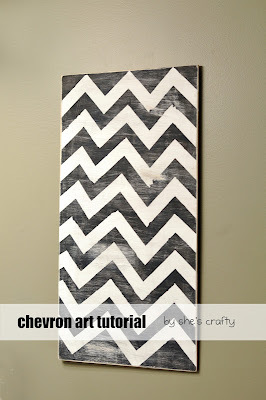 I finally jumped on the chevron bandwagon and made some chevron wall art. 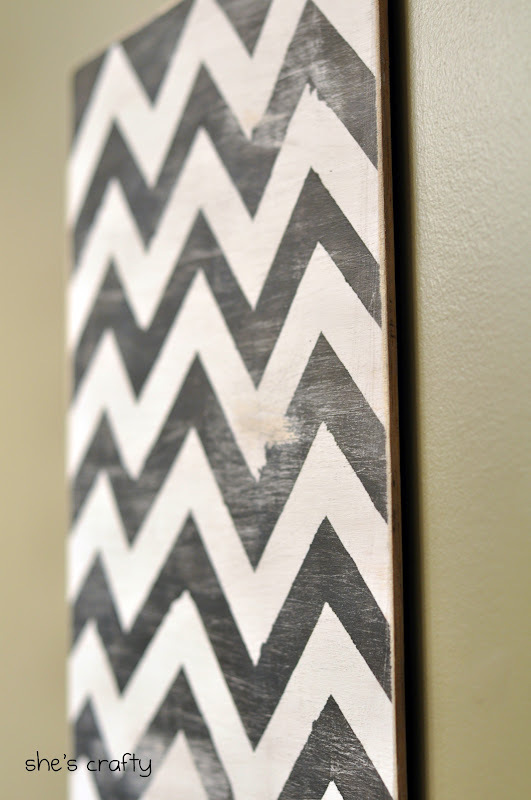 I started with a piece of wood (I used luan), and black & white acrylic craft paint. The luan was left over from another project so it was already cut to size and sanded. First I painted the board white. I wanted it to look uneven and rough so I just slapped it on there with a sponge brush. 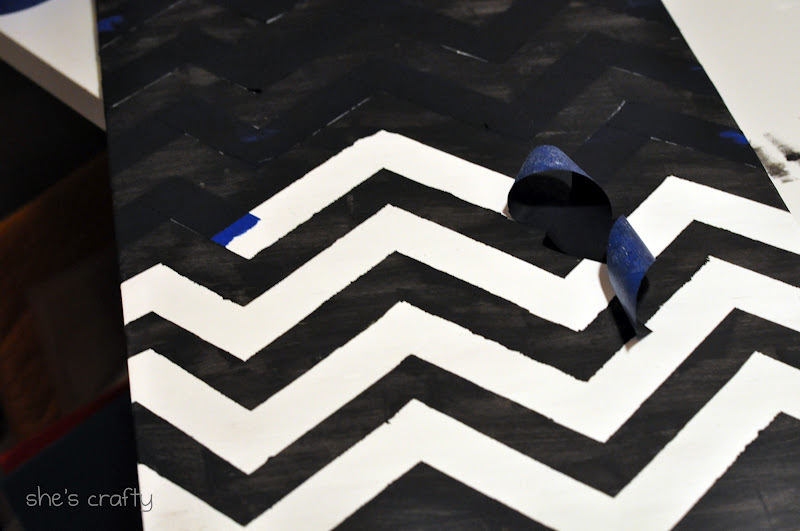 After the paint was dry I taped off the zigs and the zags. I eyeballed the taping (no measuring) so the lines are not even. I am ok with this- imperfect crafts are right up my alley. If you want it to be even, you will have to measure it all out. After all that taping was done, I painted over the board and the tape with the black paint. 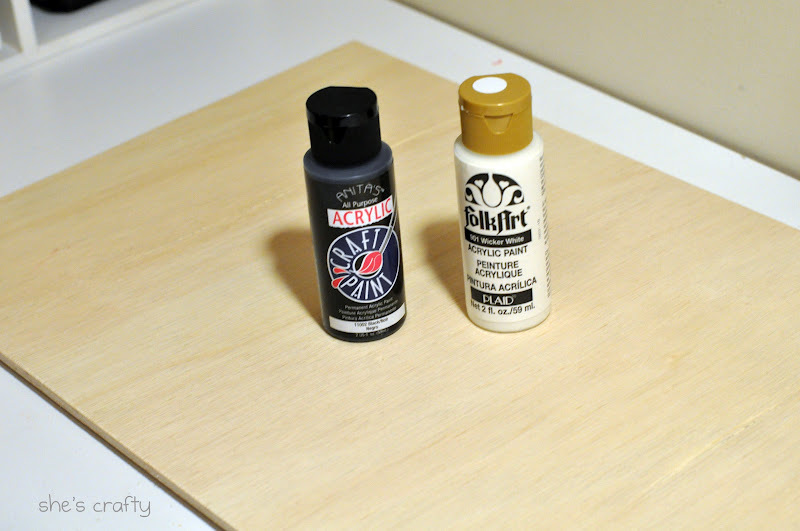 I only used 1 coat because I wanted it to look uneven and I knew I was going to sand anyway. After the black paint was dry I peeled the tape off. Then I went crazy with the sand paper. To hang it, I used my go to art hanger- 3m velcro hooks. They are the best!!! Perfect for a perpetual mind changer and re-arranger like me. I hung the art on a lonely wall in my bathroom. Every time I walk it there, it's the first think I notice. It's bold, graphic and a little big shabby. I love it!! Very cute! This made me laugh beacause...well...you'll just have to check out my blog later today...I still have to take pictures of what I did. Hi! I found you on TT&J and I love this project! I am your newest follower. Beautiful bolg! Ok, this does NOT look DIY in the least. You did an outstanding job. It's pure perfection. Thanks for the tutorial! 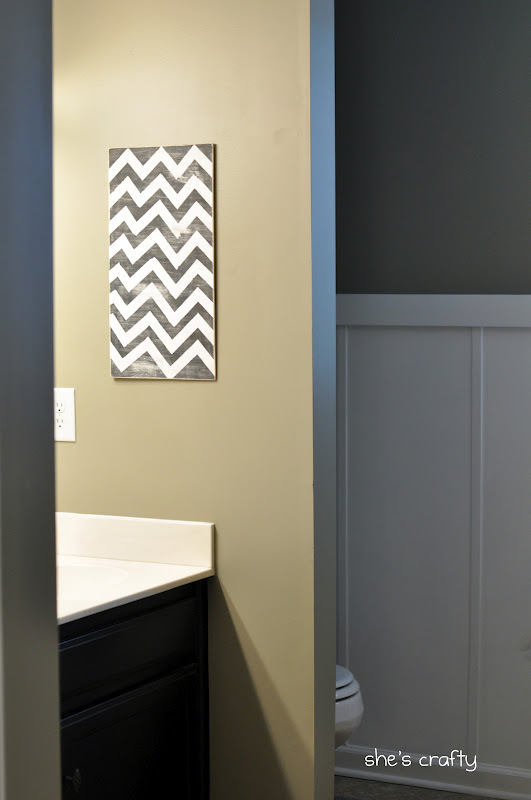 Looks fantastic - I love the neutral colors! Love this! I'm obsessed with chevron and love the sanded finish :) You did a great job!! I'd love for you to visit me over at http://tatteredandinked.blogspot.com! This turned out great! I love it. 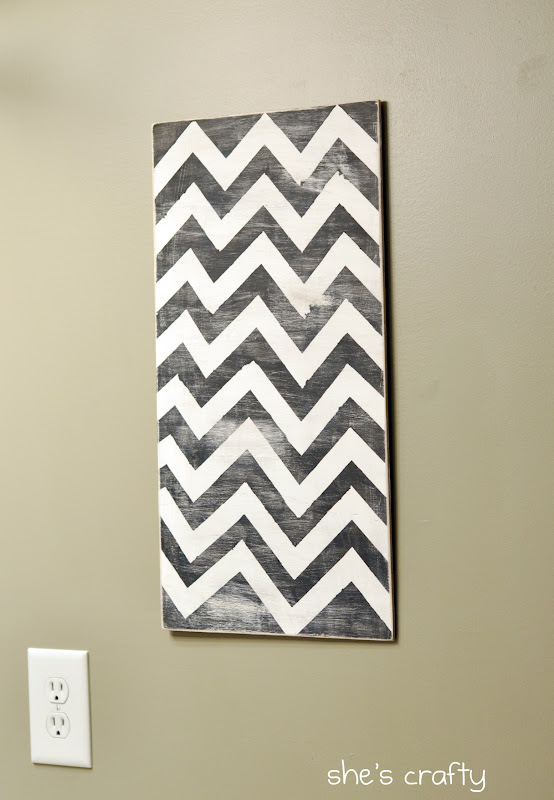 Your wall art looks amazing! I went to Hobby Lobby right after work and am making my own rendition with a canvas. Thanks for the tutorial!! your blog is great, i'm your new follower! 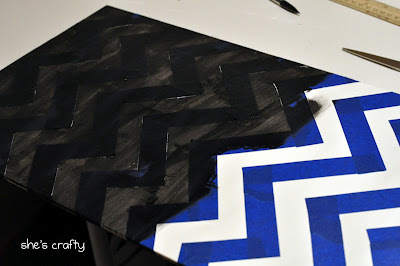 Thanks for linking to Take-A-Look Tuesday over at Sugar Bee Crafts - you were featured today!! Love it, and it's even more fun that you made it yourself. Love this - chevron is a favorite of mine! 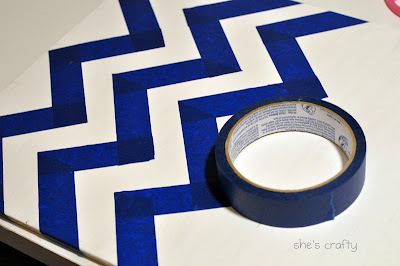 Come by my linky party and link up if you would - it's happening NOW! I would love to have you there! Awesome! Love the distressed look! Thanks for linking this up to the creative inspirations party - please come back this week to link up again! Love this! 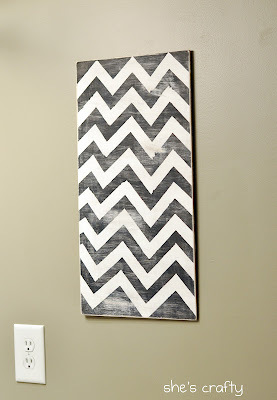 I'm going to have to make one for my gallery wall in my master bedroom! VERY NICE!!! 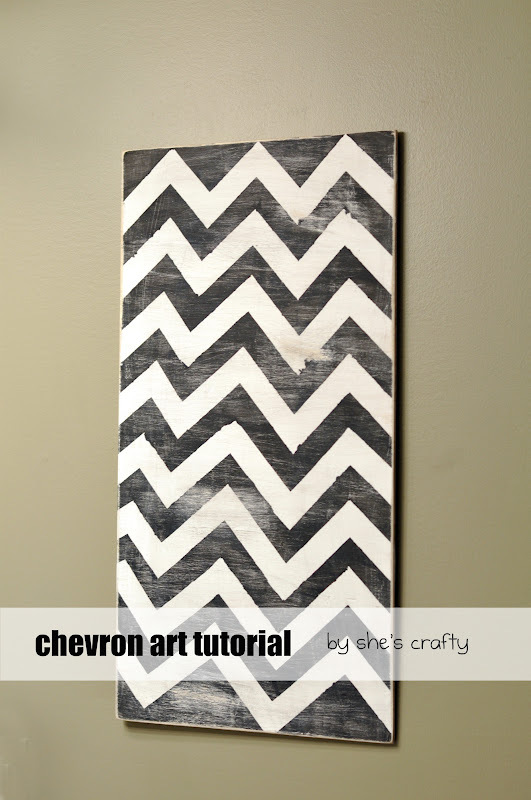 I really like your DIY Chevron art. And it goes nicely on that little wall. Thanks for joining the DIY Talent Parade. Love this! Definitely going to make one of my own! This...I LOVE! I will be doing this very soon! I'd like to post my final product on my blog as a DIY. Would you mind? I'd of course include a link back to your original post!